Bindrabun [Vrindavan]. Gate of Shet Lukhmeechund's Temple. bl.uk > Online Gallery Home	> Online exhibitions	> Asia, Pacific and Africa Collections	> Bindrabun [Vrindavan]. 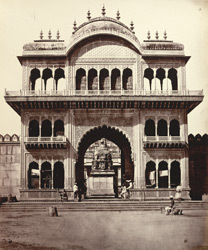 Gate of Shet Lukhmeechund's Temple.